Hope's Cafe: FIF-Dining at The Earl of Sandwich! No, we didn't dine with royalty on our recent trip to Florida. But we sure did feel like royalty when we stepped into Earl of Sandwich in Downtown Disney! We were greeted by David, the manager, who helped us out with a few recommendations and selections. Each of us tried a different sandwich, and a couple had a salad. These are not just your average subs; these are gourmet sandwiches! I ordered the Hawaiian BBQ; some of the family looked at me funny, but I love pineapple, Hawaiian pizza, and BBQ, so why not put it together? I believe altogether in our order we also had a Full Montagu, Italian, and both girls tried the Pizza Sandwich kid's meals. We also had an Earl's Cobb Salad. There are a variety of sides available as well; again not just the chips that seem to be a sandwich's loyal sidekick, but coleslaw, potato salads, fruit cups, soups, pasta salads, and if you must have them-chips. I personally chose a fruit cup; I think a couple of the kids also tried the pasta salad. They had reserved a table for us! David made sure everyone had a drink and everything they wanted, and even offered some dessert for our party. This delighted the children especially, who were quick to select cupcakes and chocolate puddings. I was tempted to have one of their strawberry shortcakes, but was afraid I wouldn't be able to eat much after the sandwich and fruit. It only took a few minutes for our meal to be prepared; the sandwiches are made fresh, and you are buzzed to come get your order. When the food arrived everyone was anxious to dig in, so we got started right away. With the first bite of my Hawaiian BBQ Sandwich, I knew I had made the right choice. This delectable sub comes grilled chicken, ham, Swiss cheese, pineapple, and a Hawaiian BBQ sauce. It's definitely not a neat eat, but ohhh so good, and worth the mess! It is also very filling; I ended up bringing almost half of mine back to the hotel for a late night snack. I asked the rest of the family what they thought, and how they liked their meal. All I got in response were some "Mmmm's" and "It's delicious!". After we finished eating, they all expressed how good the food was, and again, how filling. We ended up with a bag of leftovers that tasted great as a cold snack that night. The desserts were also a big hit; D especially liked the chocolate pudding cup, topped by a generous helping of whipped cream. The girls shared one of the huge cupcakes, and thought it was delicious. Of course, M loves anything with sprinkles, so she would have been happy no matter what! 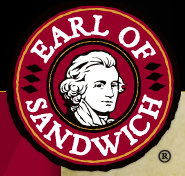 After our visit to Earl of Sandwich, I have to say this is a restaurant I will be on the lookout for as we travel. The prices are extremely reasonable, especially considering the amount of food you get. The atmosphere is family friendly, and it's not just a place to stop for a meal-it's a wonderful dining experience! "In 1762, John Montagu, the fourth Earl of Sandwich, had his hands full, literally. As First Sea Lord, he commanded the mighty British Navy, was a noted explorer, and also a dedicated gambler with a love of day long card games. This led to little time for food, so he came up with the ingenious idea (some say at the card table) of putting meat between two slices of bread. From then on it did not matter if you were fighting a great sea battle or laying down a Royal Flush, you could eat great food without too much fuss. THE WORLD'S GREATEST HOT SANDWICH®"
Disclaimer: I was not monetarily compensated in any way for this review. I did receive complimentary dining in exchange for a review. I was not required to post favorably about the company or restaurant; all thoughts and opinions are mine. All quotes (in italics) taken from the Earl of Sandwich website.